Clean, bright flavors are overshadowed by a bombardment of sweetness in this sauce that lessens its depth and complexity to a sugary fault. I assume that unless you've been living under a rock, you're familiar with the likes of Guy Fieri—the second winner of The Next Food Network Star who went on to host the popular Diners, Drive-Ins and Dives, among other shows. Say what you will of they man's personality and the fact that everything he pops into his mouth sends him straight to Flavortown, I do have an affinity to type of honest, local treasures he brings to our screen. Plus he's a true barbecue lover and even has his own competition team—the Motley Que Crew. So when I saw that he was producing barbecue sauces, I thought this could possibly be a good thing, and picked up a bottle to give it a try. 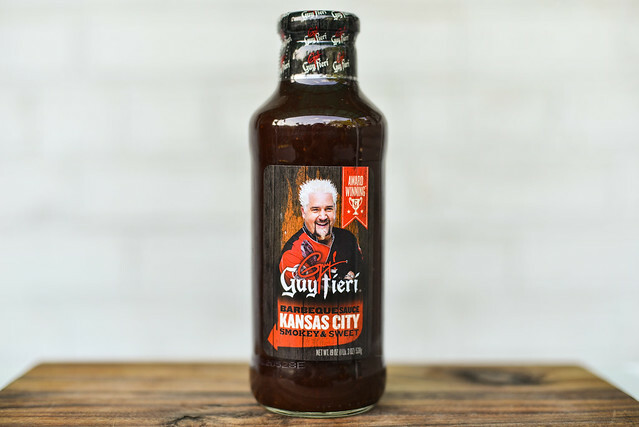 Sticking with Kansas City tradition, this sauce has an over-the-top sweet aroma. Molasses is clearly the base, along with a hefty portion of sugar. 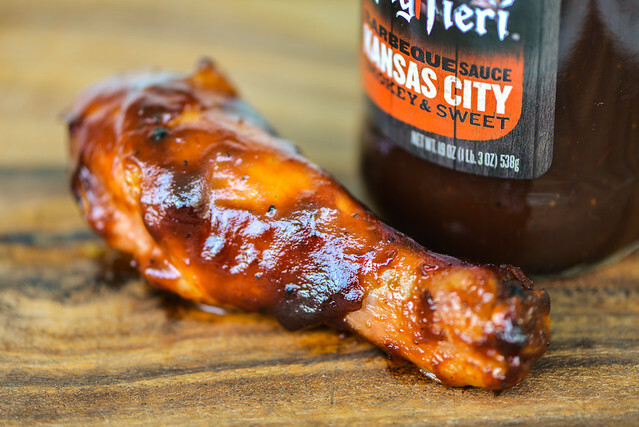 A smokiness is also right up front, giving the sauce a sweet and smoky character. There's also a distinct fruitiness that lets you know this is a tomato sauce, smelling a lot like ketchup. Vinegar is more of minor player, adding just a light tang. Onion also pops in for a little cameo. 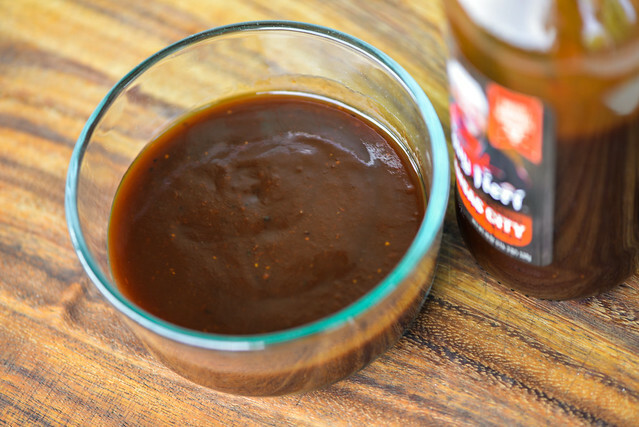 This dark maroon sauce falls just above the medium-thick line. It had a super smooth consistency, a glossy look, and some specs of spices here and there. After one initial glob, the sauce falls in a steady pour from a suspended spoon. As the sauce slows, a few final drips release and the spoon is left with a medium, semi-transparent coating of sauce still clinging. As the aroma alluded to, this sauce started out super sugary sweet. It has a flavor of extra sweet ketchup out of the gate, and it's so strong that it takes a while for the anything else to come out. It's almost not until the sauce starts to leave the tongue that a light vinegar tang comes in, along with Worcestershire and a very pleasing smokiness. Their is a mild spice that hits in the aftertaste, giving a little heat to the tang that creates a little tingly on the tongue. The sauce coated the chicken evenly and baked in well. Despite all the sugar, the sauce didn't burn over direct heat, and instead picked up some nice caramelization. Unfortunately though, what little depth the sauce had out of the jar was lost and this sauce was nothing but sweet, sweet, sweet. It gave the chicken a sugary taste from start to finish, with just a minor tang and spice that required multiple bites to build up. 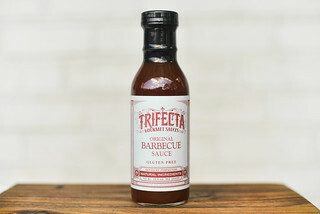 Tasting this sauce, I'd believe Guy Fieri has roots in competition barbecue—it had all the sweetness judges seem to be drawn to. That being said, it lacked the depth and contrasts that make a sauce go from good to great. Sugar was the name of the game both out of the jar and after being cooked, but it was so sweet that it almost felt one note, and therefore, a bit boring in comparison to a lot of other sauces out there. It did have nice, clean flavor though, which put it above some of its supermarket brethren in my mind. I just warn you that if you use this sauce on your ribs, chicken, or pork, be ready for some sweet meat. I couldn't agree more with your assessment. I was so disappointed as I expected more from Mr. Fiedi. This sauce was SO horribly sweet I used it once and threw the rest away. Sigh and I LOVE bbq sauce.